At VGO-Shop you are able to buy Netflix credit to be able to watch thousands of series and movies on many different devices. Only an internet connection and the Netflix App is required. The content can be used on your TV, smartphone, tablet, computer or on your game console. Another possiblity which is offered by Netflix, is to stream movies in HD quality. The requirement for it is a Netflix subscription which you can purchase by buying Netflix credit. 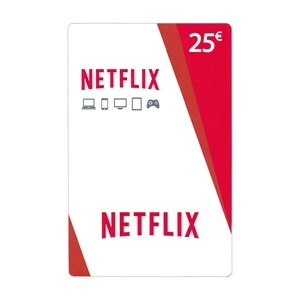 At VGO-Shop you can choose between 15€ and 25€ Netflix credit to use it by yourself or to give it as a present to your dearest. Via PayPal, Sofort banking or Skrill you can pay the credit in a comfortable way and the credit code will be delivered within a few minutes after the successful receipt of payment via e-mail. In case you buy Netflix credit at VGO-Shop, the codes can be redeemed on accounts, where the official currency is the Euro and where Netflix is available. It works with new Netflix accounts and also with existing Netflix accounts. The Netflix credit codes do not have any expiration date. Control your monthly expanses and avoid automized payments by buying Netflix credit at VGO-Shop. Netflix offers three different ways to subscribe. You can select between Basic (7,99€ / month), Standard (8,99€ / month) and Premium (11,99€ / month). The difference between basic and standard is the ability to watch your favourite series or movies in HD quality. If you want to have the possibility to use Netflix on 4 different devices in the same time and to see the content in 4K quality, the premium subscription is the correct choice for you. Buy Netflix credit – and enjoy thousands of series and movies in perfect quality, without any danger of cost traps.